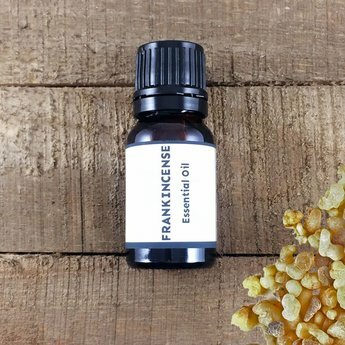 Our Frankincense essential oil (Boswellia serrata) is a colorless to pale yellow liquid displaying a spicy yet sweet, green, resinous, balsamic bouquet with a delicate coniferous undertone. The odor effect of frankincense is warming, head clearing and calming which makes it perfect for use during meditation. The soothing compounds in frankincense are referred to as boswellic acids. Frankincense is also well known for its anti-inflammatory properties such as soothing inflamed skin, burned skin, reduction of swelling and relief from bug bites and bee stings. Direct Palm / Nasal Inhaler: Place a drop of oil in the palm of your hand, gently rub the hands together, cup your hands around your nose and take a deep breath in through the nose. You can also add several drops to nasal inhaler and breathe in throughout the day. You can repeat multiple times though out the day (for wellbeing add holy basil or clary sage and sweet orange). Diffuser: Frankincense is a wonderful oil to add to a diffuser. It’s ancient uses and sacred smell transforms your house into your own personal temple (for a sacred blend combine it with myrrh, sandalwood and holy basil). Add to a carrier oil such as apricot kernel or sweet almond and add to inflamed or irritated skin (for inflamed skin such as bug bite or eczema add blue chamomile or yarrow and for burns add lavender and peppermint). Atlas cedar, bergamot, cinnamon, clove, cypress, juniper, lavender, lemon, mandarin, neroli, patchouli, rose, sandalwood, sweet orange, vetiver. Frankincense has been used in ritual practice and medically in India, the Arabian peninsula and North Africa since ancient times. Frankincense was included in the gifts presented by the wise men to the infant Christ together along with gold and myrrh. It was introduced to the church at the beginning of Christianity in Europe during the Middle Ages. Burning frankincense in churches had disinfectant purposes as well as spiritual importance. Cautions: Generally regarded as non-toxic, non-irritant and non-sensitizing.